Nate, the owner of NL Autosports, contacted us a few weeks back. He wanted to have a feature-rich website with a lot of functionality. Once we understood his needs, we got to work right away on the site. During the web design process, he also decided that he wanted to have a professional logo created for his business as well. Our graphic designer completed the logo earlier in the week – which was then applied to his site. Nate requested to have several features on his website – including a slideshow, a picture gallery, eCommerce capabilities, and vehicle listings. Nate’s website just went live today and he will soon be able to start adding his own pictures, products, and vehicles to his website. Thank you for your business, Nate, and we hope to help you with any other website needs you have! 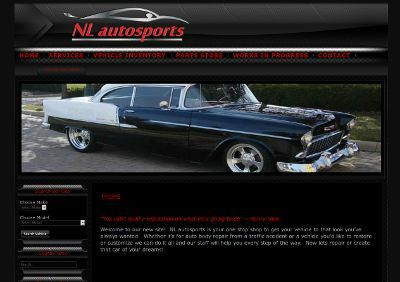 The NL Autosports website is at nlautosports.com.